Greetings Divas! 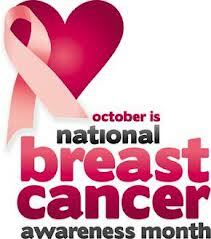 As you all should be aware, October is National Breast Cancer Awareness Month. According to the Centers for Disease Control, breast cancer is the most common cancer among women in the United States, and is one of the leading causes of cancer death among women of all races. In honor of this month, my good bloggy friend Fifi Buchanan (@divinehostess) has created a fabulous vlog to: (1) Encourage women to get to know their breasts so that they're aware when abnormal changes occur; and (2) Share 5 steps to equip our bodies to prevent cancer. Fifi covers a lot of ground in less than 4 minutes. Do me a huge favor and check out her video below. She has a powerful message that I think you should hear! Special thanks to Fifi for allowing me to spread her message on the Chronicles. Please be sure to stop by Fifi's blog, The Divine Hostess, and show her some love. Also, follow her on Twitter. - All women should know how their breast normally look and feel, and should immediately report any breast change to their health care provider. - Please note that there are different breast screening recommendations based on a woman’s family history, genetic tendencies, or other factors. These women should speak with their doctor about the need for additional tests.